Marty Turco, Nicklas Grossman and the Dallas Stars hope to make it a four-game sweep over Marcel Goc and the San Jose Sharks. Wednesday night should be a riveting night of second round playoff hockey with two games on tap. At 7 p.m., the Montreal Canadiens look to even their series with the Philadelphia Flyers at two apiece. At 9 p.m., the Dallas Stars will attempt to sweep the San Jose Sharks at American Airlines Center in the first elimination game of the second round. * Philadelphia defenseman Braydon Coburn, selected No. 8 overall in the 2003 NHL Entry Draft by the Atlanta Thrashers, is tied for fourth among the League’s defensemen with five assists. Coburn, who averaged 21:14 of ice time per game during the regular season, is earning an average of 24:05 in the playoffs. * Flyers defenseman Jason Smith, who has played more than 20 minutes in just two playoff games this season, is second in the NHL with 33 blocked shots. Smith, who has a team-worst minus-4 rating, has been a plus player in one of his seven playoff seasons. * Philadelphia has won three out of its last four games, including two of the first three games in this series, and has won by more than one goal in just one game during that span. The Flyers, who have allowed six power-play goals, have scored the most goals in the League with 33. * Flyers goalie Martin Biron, who has a Cocker Spaniel named Oscar, has allowed more than two goals just once in his last four games and has not faced less than 34 shots in any game during that span. Biron, who isn’t among the top five in goals-against average or save percentage, has faced 51 more shots than any other goalie in the playoffs. * Canadiens goalie Carey Price, who didn’t allow more than two goals in any of his first four playoff games against the Bruins, has given up at least three goals in four of his last five games while facing more than 35 shots once during that span. Price, who allowed just four goals in three regular season games against the Flyers, has allowed 10 goals in the first three games of this series. * Montreal left wing Steve Begin, who leads the NHL with 49 hits, averages just 13:11 of ice time per game. Begin had never played more than 10 playoff games in a season prior to this one, but he has a plus-3 rating in 10 playoff games this season. * Habs center Bryan Smolinski, who leads the team with 121 career playoff games played, has a plus-8 rating in his last 32 playoff games. Smolinski, who is playing for his sixth team in the playoffs, had a 51.8 faceoff winning percentage in the regular season. * After recording no points in the Sharks' seven-game, first-round victory against the Calgary Flames, left wing Milan Michalek has two goals in three games against the Stars. Michalek, who had the second-most points for the Sharks this season with 55, has a plus-10 rating in 30 career playoff games, including a plus-3 rating this season. 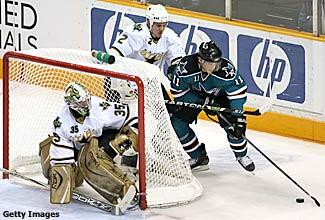 * The Sharks have lost four out of their last five games and are one loss away from being eliminated by the Stars. San Jose, which was one of just three Western Conference teams to allow fewer than 200 goals during the regular season, has allowed 10 goals in three games against the Stars. * Sharks right wing Jonathan Cheechoo, whose favorite baseball team is the Oakland Athletics, is one point shy of the team-lead with seven points. Cheechoo, who won the 2006 Rocket Richard Trophy for most goals in the League, has played more than 16 minutes in just one game this series. * The Stars, who have the most power-play goals in the League with 13, have yielded the second-lowest average of shots per game with 24. Dallas, which has won all three games they have led after the first period in the playoffs, have scored the most third-period goals in the League with 17. * After totaling just one assist and a minus-2 rating in the first round, Dallas defenseman Matt Niskanen has two assists and a plus-1 rating in three games this round. Niskanen, who averaged 20:29 of ice time during the regular season, is averaging just 18:06 during the playoffs and played just 10:53 in Game 2 against the Sharks. * Dallas center Brad Richards, who has 57 points in 54 career playoff games, has one goal and six assists for seven points in his last five games. Richards, who has scored more than three goals in a playoff season once, has scored at least 20 goals in six regular seasons.